I have such fond memories of licorice as a child. One of my favorite candies as a child was licorice. I still enjoy licorice today. I could eat my weight in licorice. And that would be a heck of a lot of licorice. Just saying. 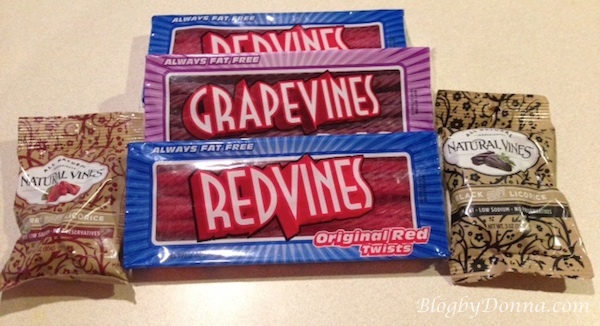 To help me celebrate National Licorice Day, Red Vine sent me some Red Vines, GrapeVines (Oh. Em. Gee. The GrapeVines are so good) and Natural Vines (soft strawberry and black). I’m not a black licorice fan, but my husband doesn’t mind, that leaves more for him. I’ve never tried the GrapeVines before but they are my new favorite. Delicious. More than 30,000 tons of Red Vines® are made each year—or more than 400,000 miles of licorice—enough to wrap around the Earth more than 16 times! In 2011, U.S. licorice sales topped $359 million, a 6.56 percent increase from the year before. It is part of the non-chocolate candy market, which had total sales of $6.87 billion. Celebrities love Red Vines! Ryan Gosling, Snoop Dogg, Joshua Jackson, Jennette McCurdy and Magic Johnson are all fans of the classic licorice brand. Betty White even credits them with keeping her 91 years young. American Licorice Company has been producing in the San Francisco Bay Area for 33 years, and its Union City, Calif., factory values process before automation: The old press that delivers the dough to the first floor is still there, the second floor cook room has large kettles that fill the dough into the old large spiral ovens before being checked for quality and packaged. It also has production facilities in La Porte, Ind. Interesting facts. Especially that Ryan Gosling loves Red Vines! Do you like licorice? I personally can’t imagine anyone not loving licorice. Really. In fact, I highly recommend you get some Red Vines to celebrate National Licorice Day. I think every day is Licorice Day! An industry leader in manufacturing and marketing candy products, the American Licorice Company is one of the original licorice manufacturers in the US candy industry. Since its establishment in 1914, American Licorice has brought happiness to consumers with their Red Vines®, Snaps®, Sour Punch®, Super Ropes® and Natural Vines® candy. Additional information is available online at www.americanlicorice.com. Disclosure: I received Red Vines® Licorice to facilitate my review. No other compensation was received. All opinions are 100% my own and may differ from yours. I am disclosing this in accordance with the Federal Trade Commission’s 16 CFR, Part 255: “Guides Concerning the Use of Endorsements and Testimonials in Advertising. I love me some red licorice. Ooh I LOVE Red Vines! I’ll have to celebrate today! I have to admit I’ve never liked licorice – My kids love it and I buy it all the time and so do most of their friends…I guess I had too many black jelly beans as a child! I used to love me some licorice but now it just tastes funny. I do NOT like black licorice, but red is pretty good. Have never heard of grape. Oh. My. Yumminess! And, I’m not just talking about the RedVines! Seriously, though, I LOVE licorice, especially black licorice, so this is right up my alley! I don’t really like the taste of black licorice, but I do like red. I Love licorice! My favorite is black. I love red vines and I really like the Ryan Gosling part. Oooh I didn’t know it was licorice day! I love all kinds of red licorice. Red Vine has a total different taste then Twizzlers. What a fun way to celebrate National Licorice Day! I love licorice! I especially love black licorice and black licorice ice cream! YUM! My mom is the biggest licorice lover I know! I have a love/hate relationship with licorice, lol. I really enjoy red licorice and now I want some! This is my mom’s favorite candy! I love Red Vines and all kinds of licorice! I don’t think I ever remember eating Red Vines!